Industrialization, with strong linkages to domestic economies, will help African countries to achieve high growth rates, diversify their economies and reduce their exposure to external shocks. This will substantially contribute to poverty eradication through employment and wealth creation. The success of Africa’s industrialization programme will require the creation of enabling environment that enhances domestic capacity in respect of physical and social infrastructure, human capital, financial systems, research and development (R&D), technology and governance. Highlighting the opportunity to identify innovative, solution-driven actions and policies to advance pharmaceutical production on the continent, the 2018 Africa Industrialization Day will focus on “Promoting Regional Value Chains in Africa: A pathway for accelerating Africa’s structural transformation, industrialization and pharmaceutical production”, in the context of the Africa Continental Free Trade Agreement (AfCFTA) and the Third Industrial Development Decade for Africa (IDDA III). The pharmaceutical industry constitutes an important factor in advancing the continent’s development. In a study based on data from the African Development Bank, the World Bank and the World Health Organization among others, the value of Africa’s pharmaceutical industry was estimated to have jumped to \$20.8 billion in 2013 from just \$4.7 billion a decade earlier, with no sign of slowing down: by 2020, predictions put the annual market’s worth at \$40 billion to \$65 billion. Production of medicines in closer proximity to where they are needed can contribute to improved health outcomes and has the potential for job creation in a knowledge-intensive industry, making it an integral part of reaching the sustainable developments goals as well as Africa’s Agenda 2063. In order for the pharmaceutical manufacturing industry to reach its full potential in empowering African economies, there is a need to highlight the importance of the sector and the requirement for greater support to be provided for its long-term development. 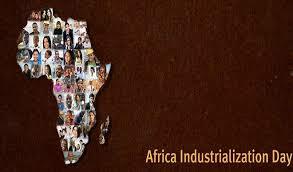 The 2018 Africa Industrialization Day will be celebrated at UNIDO’s headquarters in Vienna, with an event organized by UNIDO with the support of the United Nations Office of the Secretary-General, the UN Economic Commission on Africa (UNECA), and the African Union Commission (AUC). Within the framework of the Second Industrial Development Decade for Africa (1991-2000), the United Nations General Assembly, in 1989, proclaimed 20 November “Africa Industrialization Day” (A/RES/44/237). Since then, the United Nations System has held events on that day throughout the world to raise awareness about the importance of Africa’s industrialization and the challenges faced by the continent.